Lots of users. Lots of devices. Lots of video. This is the formula that will lead to global internet traffic reaching an estimated total of 1.6 zettabytes in 2018 — or 13 times the total internet traffic from 2008. A zettabyte is a trillion gigabytes, which in itself is almost meaningless to most people. 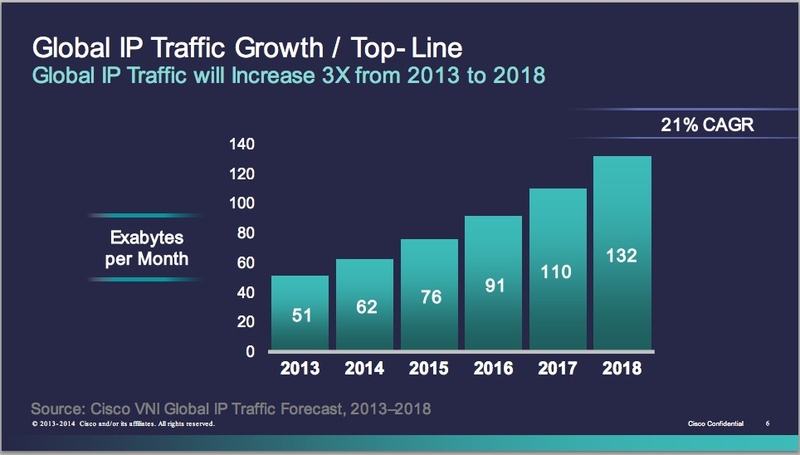 The figure, provided by Cisco as part of its annual visual networking index, is part of an effort to track the growth of the internet and overall IP traffic. Cisco (s csco) has been doing this for nine years, and is generally sound when it comes to forecasting the overall traffic (its more granular estimates can be less accurate). Besides the zettabytes, video and the growing constellation of devices are the star of this year’s forecast. 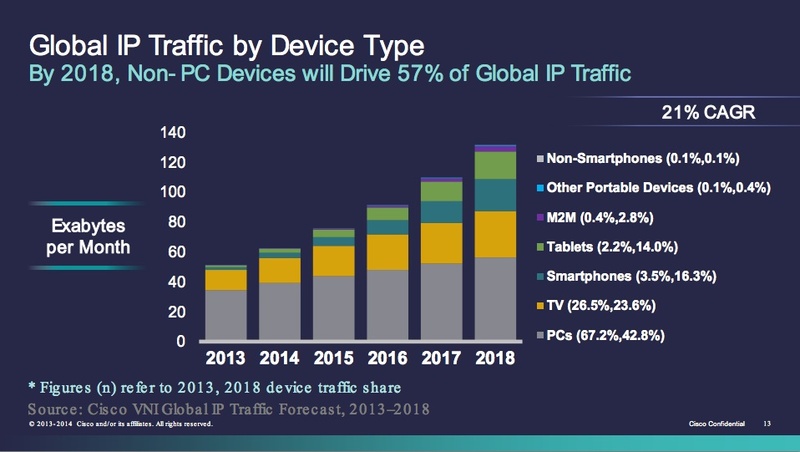 Cisco estimates that video will comprise 79 percent of all IP traffic in 2018, up from 65 percent in 2013, and that people will own an average of 2.7 devices, up from 1.7 in 2013. About 52 percent of the global population, or 4 billion people, will be online. All of this means more traffic. But it’s worth digging into the subtle data about video usage and the data on connected devices and individual usage. Let’s take a look. Next is a two-part breakout involving video. There will be a lot of it, and the rise in overall video consumption will help change broadband usage profiles for people significantly. If the estimates below are accurate, it’s kind of scary to think that Comcast is currently testing 300 GB per month data caps (but, uh, Comcast would like you to know it doesn’t have a cap). 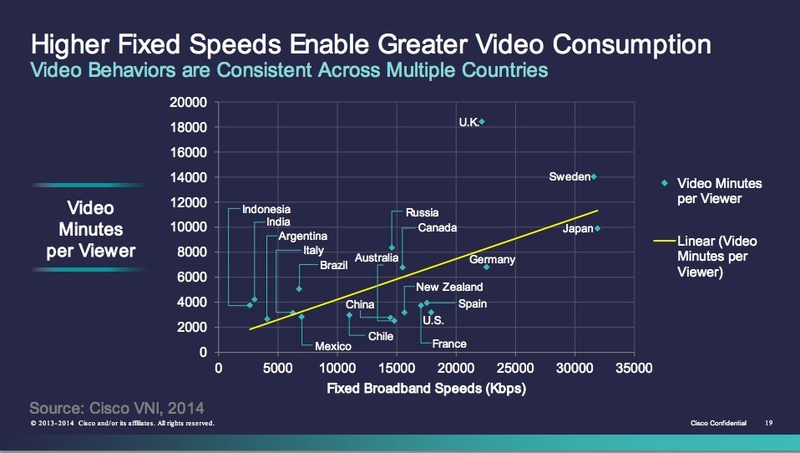 The other data involving video shows that despite faster speeds, only a few countries have seen skyrocketing over-the-top video usage. In part, this is because pay TV providers are letting customers watch shows on demand and on whatever devices they want. It probably also relates to usage caps, peering fights and other ISP actions that can make it painful or expensive to watch video via internet-based services like Netflix(s NFLX) and Hulu. The rest of the index is chock-full of stats and charts about broadband usage that are also worth digging into. 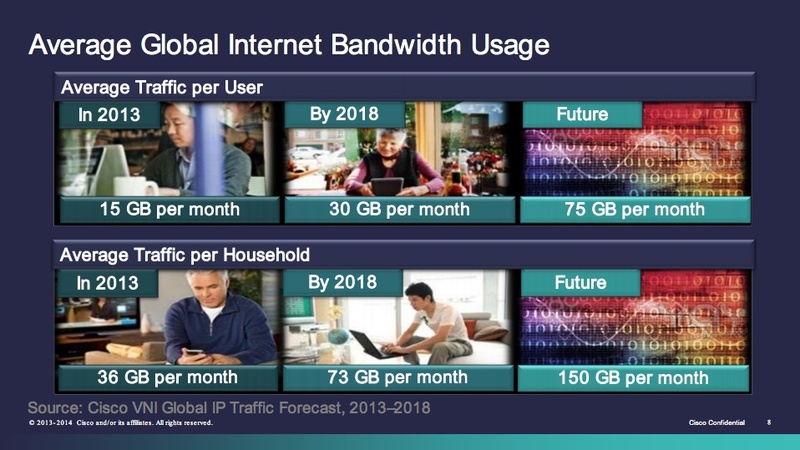 So check out Cisco’s presentations and data to see how much and how we’re going to be using our broadband networks four years out. Comcast testing data caps, and they want to complete that merger, strengthen the monopoly, that’s scary you guys, can anybody stop them?! As bandwidth grows it gets cheaper.